Create an eye catching graphic for Facebook Ads using the description given below. - Only handle full of money changers will be shortlisted to participate in this early stage. You will enjoy extra leads coming from our web, iOS, and Android apps. Please feel free to ask any questions. 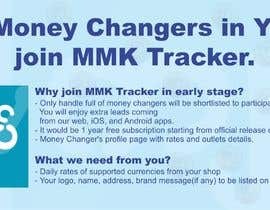 Read more about MMK Tracker on Medium. Ready to sign up? Click here to sign up([login to view URL]).